Beginning Friday, Dec. 14, and continuing through Christmas Day, 89.1 WBCX airs Sounds of the Season 6 a.m. to midnight daily. It’s an extensive holiday music mix, including your favorite pop, jazz and classical Christmas standards, plus an extra helping of holiday tunes you won’t hear anywhere else. “WBCX Sounds of the Season is perfect for trimming a Christmas tree, listening in the car while out and about, or online listening no matter where you are. It’s a longtime listener favorite guaranteed to get you into the holiday spirit,” said Director of Broadcasting & Digital Communications Jay Andrews. WBCX BBC World News fans will still receive daily doses of international news late nights from 12-6 a.m. 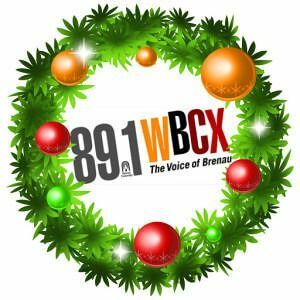 Happy Holidays from Brenau’s radio station, 89.1 WBCX! Click to Listen Live to 89.1 WBCX!